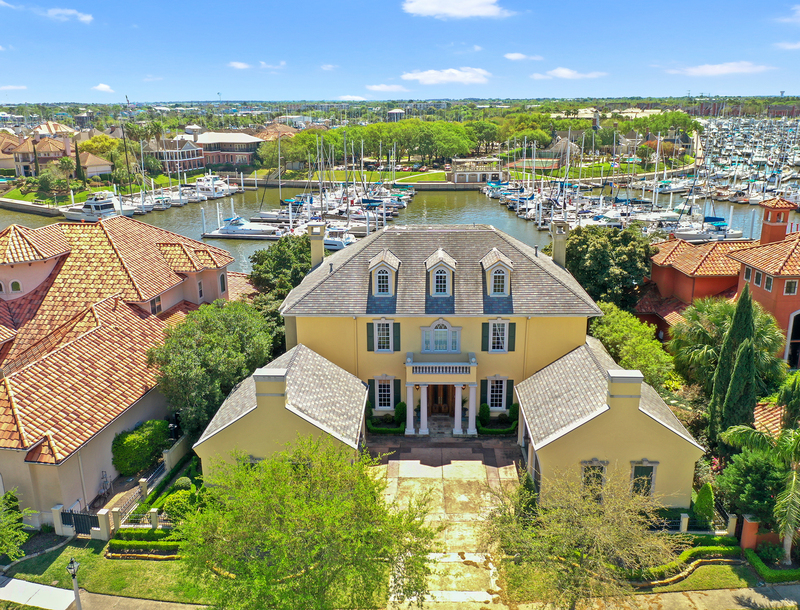 Welcome to 19 Waterford Oaks Lane, an absolutely stunning waterfront manor designed for the seller around her antiques and architectural gems. Made for gracious modern living, this home enjoys views of the marina from most rooms as well as the upstairs and downstairs terraces. There are three, possibly four bedrooms, and four and one-half bathrooms in approximately 5,030 square feet. From the grand entry with its sweeping stairway and herringbone wood floors to the amazing Zuber wallpaper (per seller) in the dining room, the architectural detail throughout the home, the large kitchen with Viking range and cabinets in abundance, the butler’s pantry with more storage space, the inviting library with wet bar and built-in study nook, no detail was left unattended. This home has two two-car garages with one having a large workshop attached. This home also has its own dock, and there is a large unfinished secret room (not included in the square footage) providing the potential for a home gym or media room. Located in Waterford Harbor behind two gates, the area was designed for privacy. Fine living can be yours in this spectacular home. Please click here to see the photos and listing information and please let me know if you have any questions about this premier waterfront home. This home is co-listed with Jennifer Larsen.